Kuala Lumpur, November 1st-2nd, 2017. 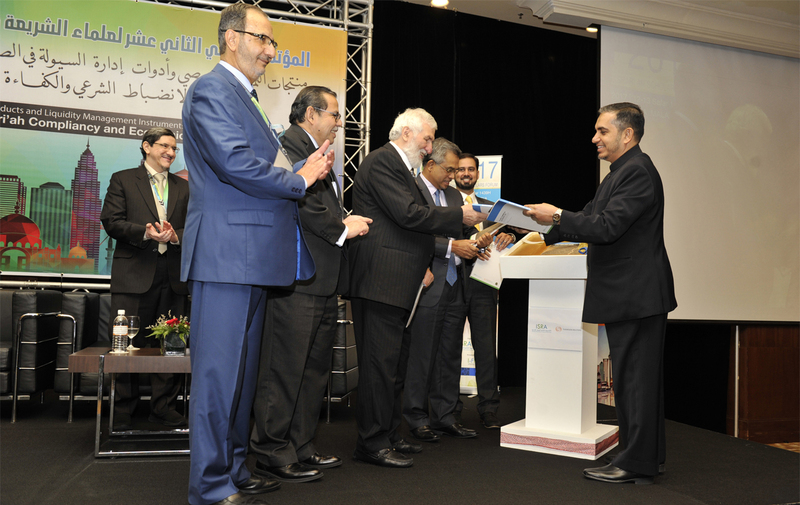 The International Shariah Research Academy for Islamic Finance (ISRA) jointly organised its twelfth annual International Shariah Scholars Forum (ISSF 2017) with the Islamic Research and Training Institute (IRTI) of the Islamic Development Bank in Jeddah and the University of Jordan. The Forum was held at Sama-Sama Hotel, Kuala Lumpur International Airport (KLIA), Malaysia. The two-day forum commenced with a recitation of some verses from the Quran followed by welcoming remarks by Prof Dr Mohamad Akram Laldin representing ISRA, Dr Sami Ibrahim Suwailem representing IRTI and Prof Dr. Muhammad Al-Khatib representing the University of Jordan. The first keynote speech for the first day entitled “An appraisal of personal financing products and liquidity management instruments in the light of Maqasid al-Shariah” was delivered by Sheikh Dr Abdul Sattar Abu Ghuddah highlighting the urgency to find lasting solutions to the issues of shortage of personal financing products and liquidity management instruments. The second keynote speech for the first day on the same topic delivered in English was delivered Prof Dato’ Dr Mohamad Azmi Omar emphasised the need for effective liquidity management instruments for financial stability. The forum continued with the first session under the theme “Shariah concepts of personal financing products and liquidity management instruments”. The topics of the two papers presented in this session were “Personal Financing Products and Challenges of compliance with Shariah foundations” and “personal financing products and challenges of compliance with Shariah foundations”. In the afternoon, Sheikh Datuk Dr Mohd. Daud Bakar accompanied by Prof Dr Mohamad Akram Laldin and Mr Mustafa Adil, head Islamic Finance of Thomson Reuters launched the ISRA-Thomson Reuters Islamic Commercial Law Report 2018 followed by video presentation of the Report. The second session of ISSF critically analysed main criteria for the efficiency of Islamic personal financing products and liquidity management instruments. The first paper examined Shariah parameters for the efficiency of Islamic personal financing products and liquidity management instruments in Islamic banks while the second discussed Islamic liquidity management in the light of Maqasid Al-Shariah (Objectives of Islamic Law). The third session appraised the effects of liquidity management instruments on debts and indebtedness of Islamic financial institutions (IFIs). The first paper examined the effects of liquidity management instruments on indebtedness of IFIs. The second paper studied liquidity management instruments between debt based instruments and equity based instruments in Islamic bank in a comparative perspective. The fourth session appraised the effects personal financing products on personal debts and public debts. The first paper assessed the effects of personal financing products on individual debts. Also, the second paper assessed the effects personal financing products on public debts. Along with ISSF, ISRA and University of Jordan jointly organized a workshop on the role of academic institutions and training centers in preparing human developments in the Islamic finance industry in the first day of ISSF. Presenters included Dr. Basel al-Shaer and Dr. Hiyam Alzedaneen from the University of Jordan and Dr.Younes Soualhi from ISRA. The second day of the forum started with the presentation of the lead presenter Sheikh Dr. Osaid Adeb al-Kailani on AAOIFI Shariah Standard No 58 (REPO – Repurchase Agreement). Following the second session, ICSB (the consultancy arm of ISRA) signed Memorandum of Understanding (MOU) with Tawafuq Consultancy while ISRA itself signed Memorandum of Collaboration (MOC) with University of Sultan Azlan Shah (USAS), Perak and Kolej University Islam Perlis (KUIPs). The third session dealt with the Bank Negara Malaysia (BNM) Shariah Standards and Operational Requirements with special focus on methodological perspective. The final session was an open dialogue with the scholars. In this session, the panellists further discussed issues and challenges of Islamic personal financing and liquidity management instruments and Shariah solutions to address those issues and challenges. At the end, they proposed solutions and innovative ideas to promote the Islamic finance industry. Prior to close this session, Dr Younes Soualhi, Senior researcher at ISRA called upon Datuk Dr Mohd Daud Bakar and Prof Dr Mohamad Akram Laldin to give Best Paper Awards to the winners. At the end of the programme, Assoc. Prof Dr Said Bouheraoua, Director of Research Affairs, at ISRA read out the resolutions of this year’s forum and vote of thanks to all the scholars, industry players and academicians who contributed to the success of the forum.